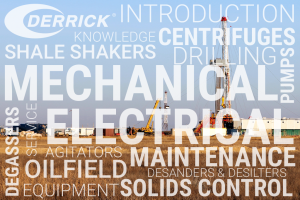 Derrick® will be hosting an Service and Maintenance for Solids Control Equipment course taking place July 22-26 at our Houston, Texas office location. Service and Maintenance for Solids Control Equipment is designed for the oilfield tradesperson with both mechanical and electrical responsibilities on solids control equipment. Read the Course Description for a detailed agenda.